Testing duration in stock markets concerns the ability to predict the turning points of bull and bear cycles. 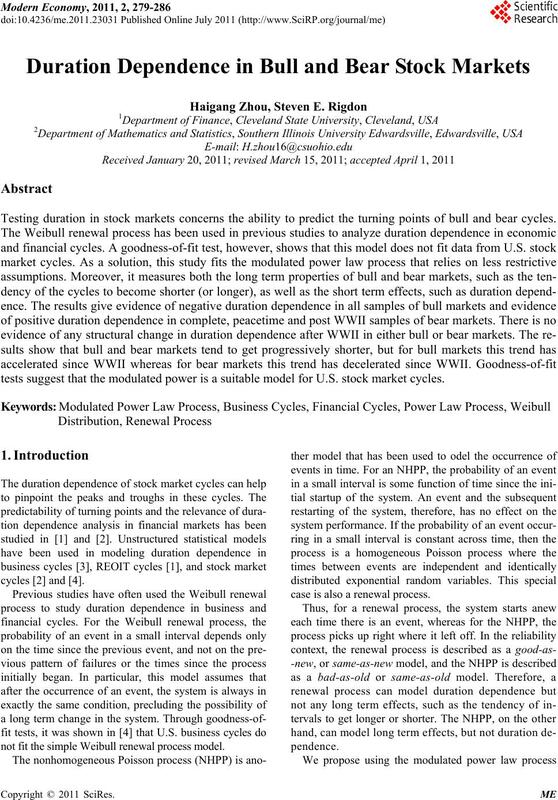 tests suggest that the modulated power is a suitable model for U.S. stock market cycles. not fit the simple Weibull renewal process model. case is also a renewal process. H. G. ZHOU ET AL. a compromise between a renewal process and an NHPP. 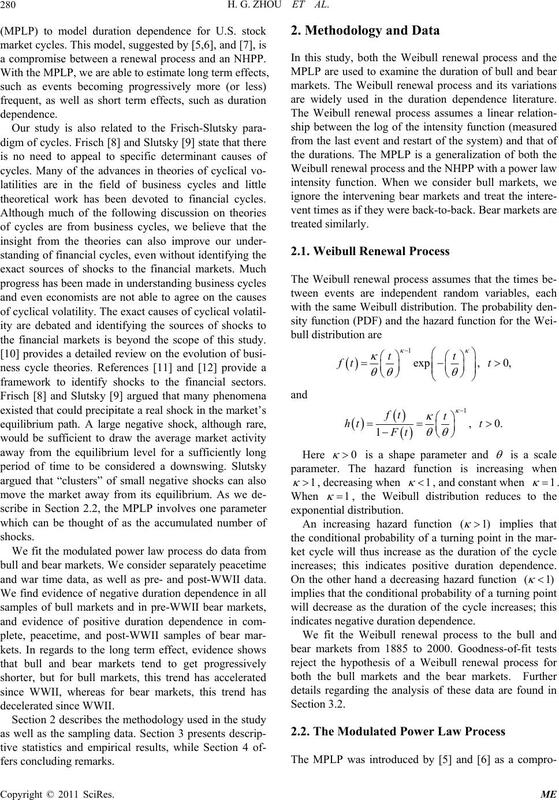 theoretical work has been devoted to financial cycles. the financial markets is beyond the scope of this study. framework to identify shocks to the financial sectors. 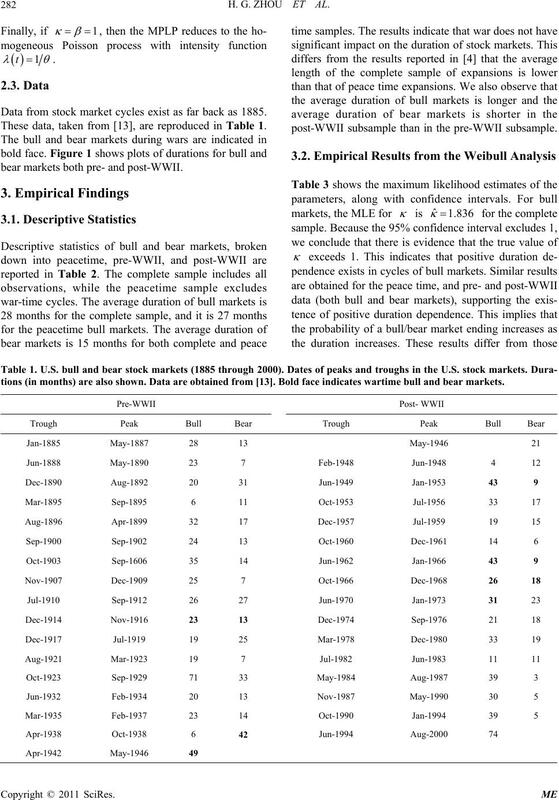 and war time data, as well as pre- and post-WWII data. are widely used in the duration dependence literature. increases; this indicates positive duration dependence. after an event and restart of the system. counter is reset to zero, but time t is not reset to zero. such as the tendency of times between events to increase. and shorter intervals between events. times measured from the initial startup of the system. 125 2.5 shocks that cause a failure. interevent times and a few very long interevent times. is a Weibull renewal process. values in a generalization of the Weibull renewal process. post-WWII subsample than in the pre-WWII subsample. 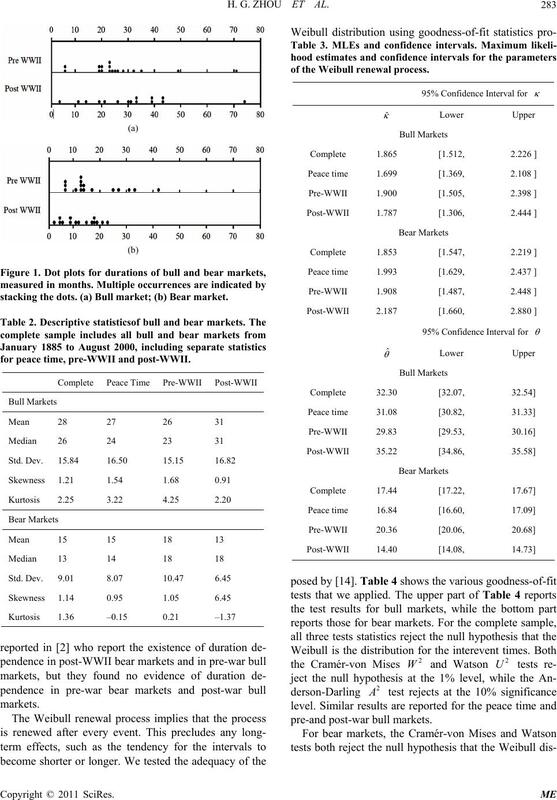 Data from stock market cycles exist as far back as 1885. These data, taken from , are reproduced in Table 1.
tions (in months) are also shown. Data are obtained from . Bold face indicates wartime bull and bear markets. stacking the dots. (a) Bull market; (b) Bear market. for peace time, pre-WWII and post-WWII. of the Weibull renewal pr oce ss. pre-and post-war bull m a rkets. tribution is adequate at the 1% significance level. peace time and post-war samples. 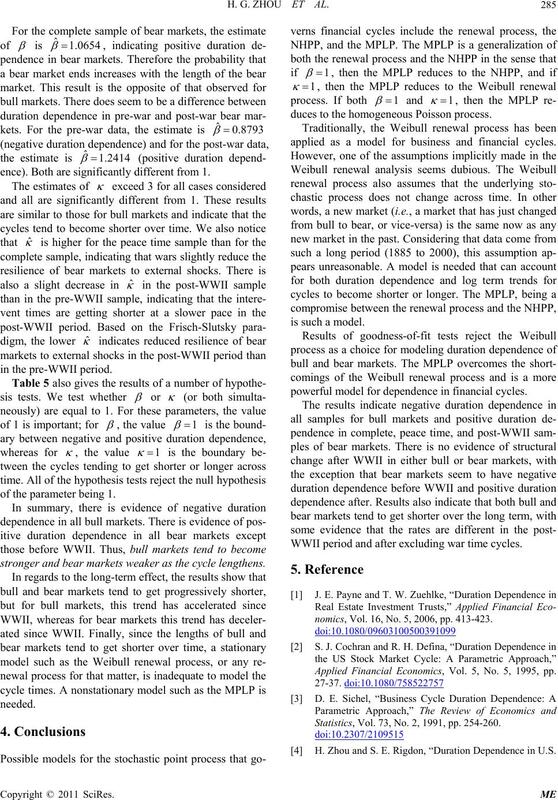 a stationary model, such as the Weibull renewal process. 0.931 with similar im plications. shortly decreases as the length of a bull market increases. ence). Both are significantly different from 1.
in the pre-WWII perio d.
of the parameter being 1.
stronger and bear markets weaker as the cycle lengthens. duces to the homogeneo us Poi sso n pr ocess. applied as a model for business and financial cycles. powerful model for dependence in financial cycles. WWII period and after excluding war time cycles. nomics, Vol. 16, No. 5, 2006, pp. 413-423. Applied Financial Economics, Vol. 5, No. 5, 1995, pp. Statistics, Vol. 73, No. 2, 1991, pp. 254-260. H. Zhou and S. E. Rigdon, “Duration Dependence in U.S.
Vol. 32, No. 1, 2008, pp. 25-34. Congress, Milwaukee, 20-22 May 1991, pp. 559-563. Technology, Vol. 28, No. 1, 1996, pp. 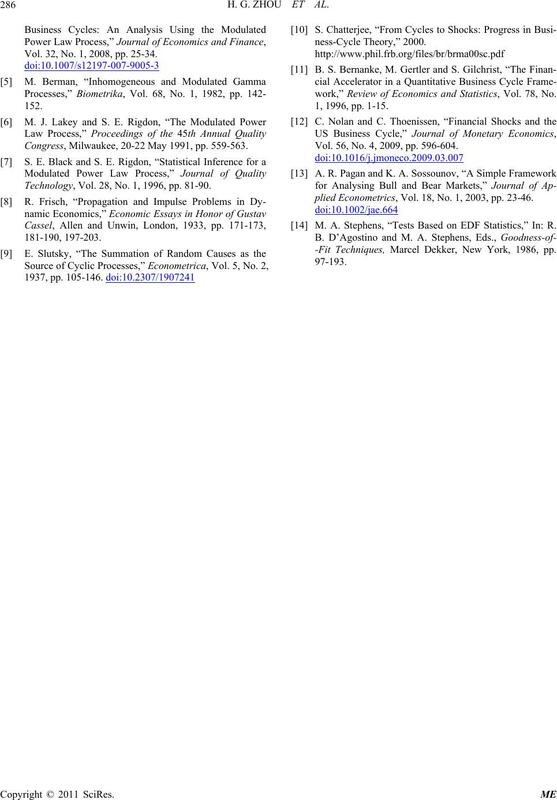 81-90.
work,” Review of Economics and Statistics, Vol. 78, No. Vol. 56, No. 4, 2009, pp. 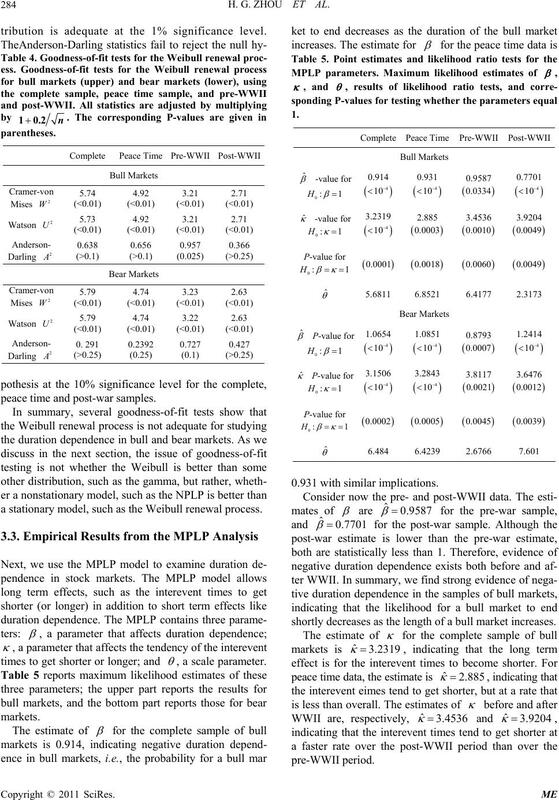 596-604.
plied Econometrics, Vol. 18, No. 1, 2003, pp. 23-46. 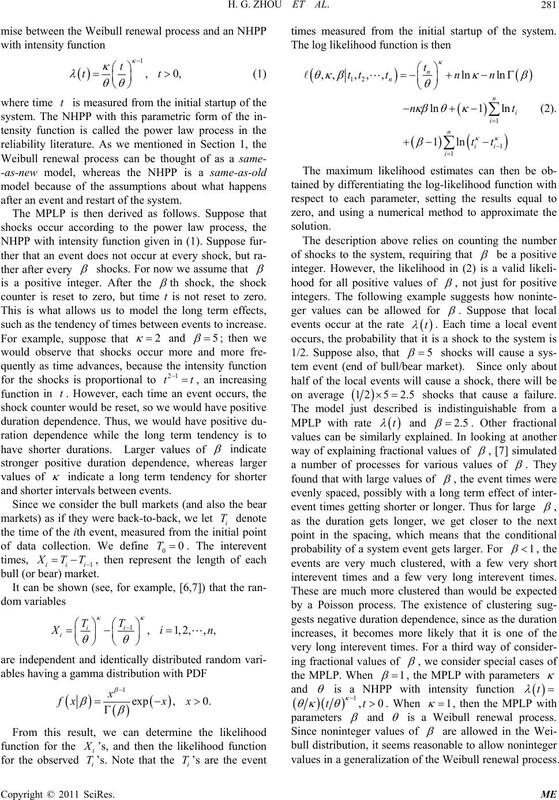 M. A. Stephens, “Tests Based on EDF Statistics,” In: R.
-Fit Techniques, Marcel Dekker, New York, 1986, pp.